VG+/VG DS 161/63, Rare 1968 orig. 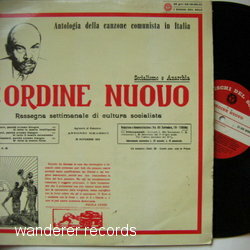 Anthology of communist songs in Italy. 1962 - 1967s recordings + 1 track registered by Alan Lomax in 1954. Very slightly played but it has surface micro-defects caused by storing without innersleeve in dusty cover.